The Singapore Boating Industry Association is the representative body for businesses related to recreational watercraft activity in Singapore. We represent Singapore at ICOMIA (International Council of Marine Industry Associations), the international trade association representing the global marine industry since 1966. We have worked with the Singapore Yacht Show on the conferences & forums alongside it, to promote boating in Singapore & the region. This year, we will broaden our reach to work with ADEX on the watersports component in it. A number of stands will be dedicated to water sports for 2018. With the help and support of the watersports community, we hope this will seed a larger watersports section in future years. We look forward to hearing your ideas and feedback for this new endeavour. The Singapore Boating Industry Association (SBIA) is working with ADEX (Asia Dive Expo) to develop a watersports show. For 2018, this will be a small cluster within ADEX the dive show, but it is hoped that the watersports show will grow into an event in its own right. ADEX runs 06-08 April 2018 at the Suntec Convention Centre. More information is available on www.watersportsasia.org. The watersports scene in Singapore and Asia is vibrant and diverse. Watersports activities include (among others) kayaking, canoeing, rowing, dragon boats, sailing, windsurfing, SUP (stand up paddling), kite-surfing, jet-skis, water-skiing & wakeboarding. Activity centres and instruction at all levels is available in many centres across Singapore. Venues include various marinas, sailing clubs (Changi, SAF Yacht Club), beach clubs (along the East Coast & Sentosa). YP Loke, chairman of SBIA, said, “As part of watersports development, SBIA hopes to showcase and promote the sector to a growing body of users and prospective customers. The sector in Singapore is well institutionalised, with many national sea sports associations recognised by the Singapore Sports Council. The support of public agencies such as the Ministry of Education and People’s Association is a testament to the many benefits that a healthy outdoor activity like watersports bring to the family and community”. John Thet, show organiser for ADEX and Watersports Asia, said, “Watersports compliments diving and although we start off the watersports section modestly within ADEX, we hope to grow the show over the years so that it can stand on its own”. SBIA is the apex organisation for the boating and watercraft industry in Singapore and represents it at ICOMIA (www.icomia.org), the world body for recreational boating. 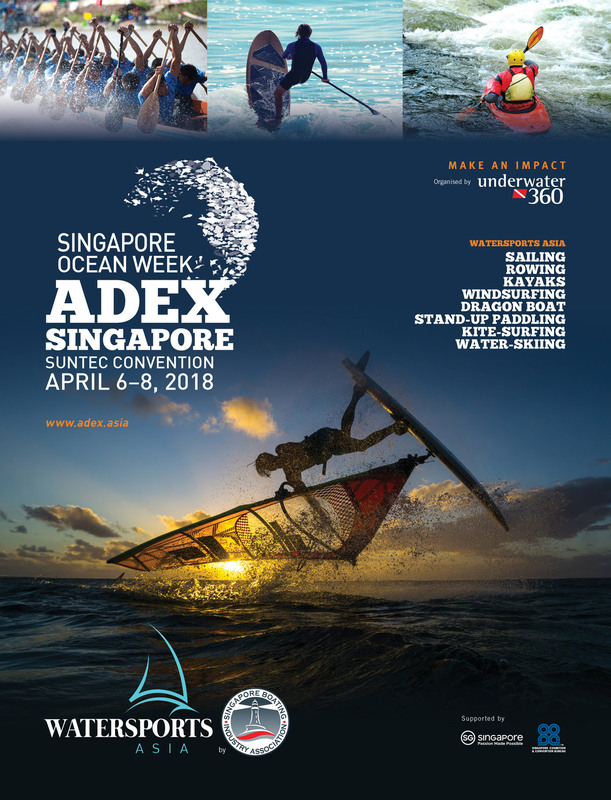 ADEX Asia is the organiser of Singapore’s premier dive show and now introducing Watersports Asia as part of the event offering. To exhibit at the Watersports show, call +65 6298 3241 or email marketing@uw360.asia. For more information visit www.watersportsasia.org.